More than 70 percent of all company offices with 50 or more employees use server virtualisation. 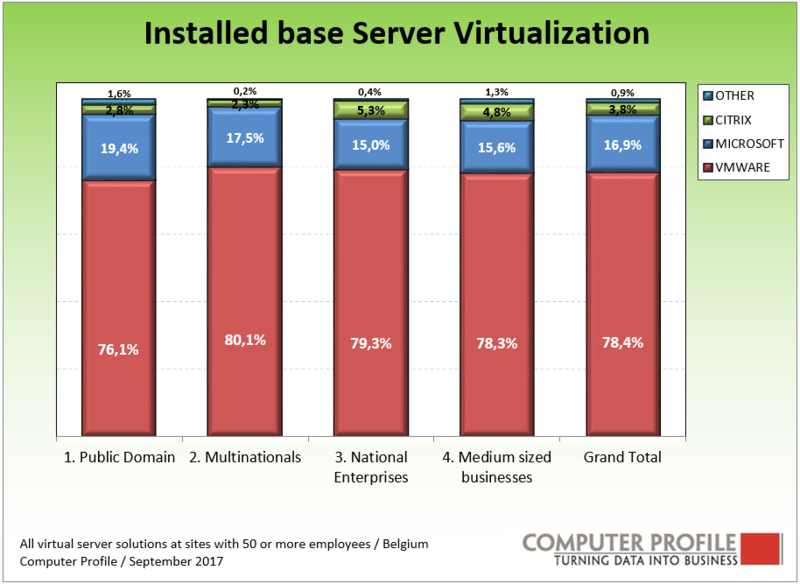 The most popular solution for server virtualisation is VMware (78.4%). Then comes Microsoft with 17 percent and about 4 percent of the inventoried solutions are from Citrix. These results have emerged from an analysis by Smart Profile of about 4,000 interviews held with IT managers from company offices with 50 or more employees on the infrastructure used. The differences between the different market segments are relatively small. VMware seems to enjoy its strongest position within government authorities and manufacturing. Microsoft is also performing well in manufacturing and financial services. Software for server virtualisation is used most in the IT and telecom sectors, where more than eight out of ten companies use it. Use is lowest in the construction sector where less than two thirds of the locations apply server virtualisation. We have seen across the board that growth of the virtualisation solutions that we have defined in our database has begun to level off in recent years. Almost one fifth of the interviewed locations said that they use application virtualisation solutions. But this is practically the same percentage as what we found in 2016 and in 2015. These mainly concern application virtualisation solutions such as Citrix Xenapp and Microsoft App-V. Moreover, we have not seen any increase for desktop virtualisation at Belgian company sites. The percentage of company locations that say they use these solutions remains around 4 percent. The largest shares in virtualisation are to be seen in server virtualisation. Over 70 percent said that they use solutions such as VMware EXSX(I) or Microsoft Hyper-V.